If you've spent time with me in real life any time in the last 15 or so years, you know that any time I get together with a large group of people, either family or friends, I always insist on taking a big group photo of everyone. It's just what I do. My kids are well trained in this, and they know that if they quickly pose and smile, the pain is over fast and they can go on with their lives rapidly. Other friends and family members took awhile longer to condition, but for the most part they have come to appreciate that I have over a decade's worth of documenting heights and hair colors and changes. Like I said, it's what I do, and there's no likelihood this quirk of mine is going to change any time soon. Yesterday was the Mid-Autumn Festival, celebrated in China and several other Asian countries. It's a public holiday here, very similar to American Thanksgiving, a time for families to gather together, eat lots of high-calorie food, and feel gratitude for the "harvest" or blessings in their lives. Several traditions including eating Mooncakes and writing a prayer on a lantern which is then lit and sent soaring into the sky under the full harvest moon. 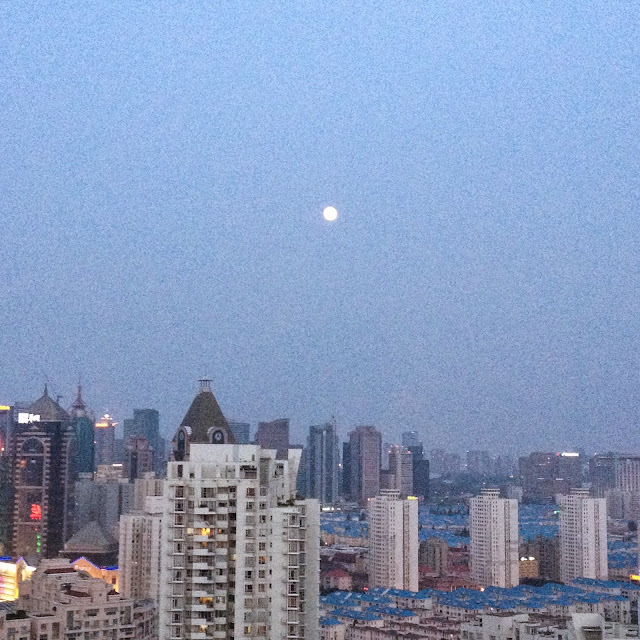 The rising Mid-Autumn moon over the rooftops seen from our bedroom last night. 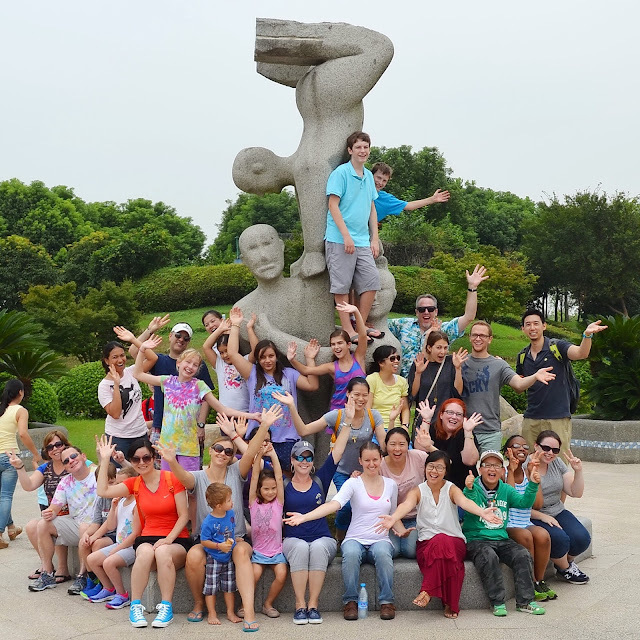 This year I decided to invite a small group of friends to join my family in heading an hour out of Shanghai's city center via Metro to Sheshan and the Sheshan Sculpture Park. If I had to rank my favorite places in Shanghai, this area definitely hits my top five. There are no Starbucks or convenience stores. There are lots of trees and plants and stretches of land where there are only bugs and small animals, and the occasional horse, to populate the area. The hotels in the area are very luxe and built to blend with nature instead of soar above it in multi-story high rises, and the whole place is incredibly peaceful. 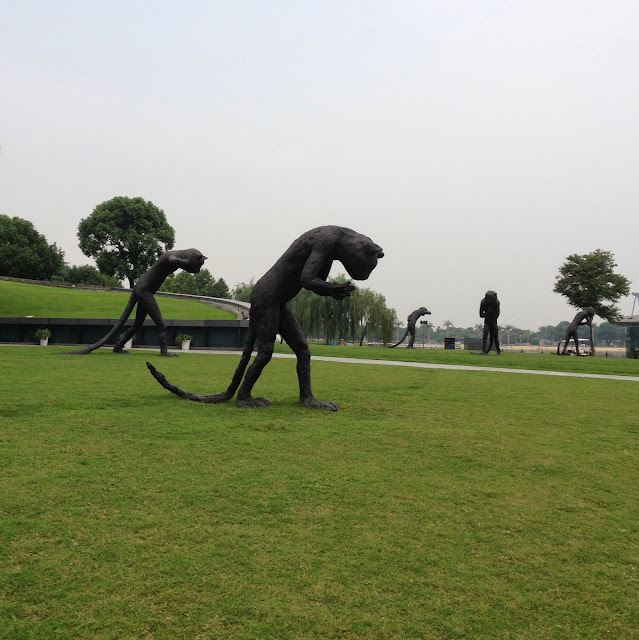 The Sheshan Sculpture Park is a paid entry area covering over 200 acres with a lake in the middle. Dotting the landscape every few hundred feet are huge sculptures created by artists from all over the world. The nature combined with art is inspiring and peaceful and fun, all at the same time. 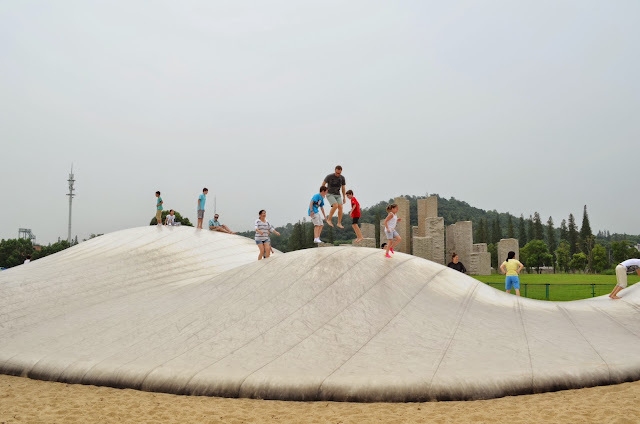 Much of the art is interactive, like the Fuwa Fuwa Dome, a large multi-domed blob which functions like a trampoline and is meant to be jumped on. 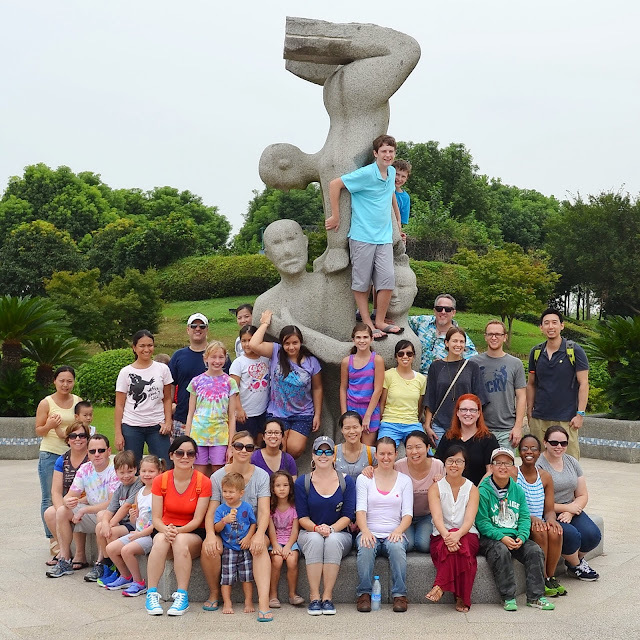 We ended up with a group of 36 friends on our field trip. This allowed us to negotiate for a group rate, knocking the entry down from about $20 USD per person to about $13 USD per person. I was happy to arrange it all and negotiate the deal and provide directions on how to get there, and all I asked for in return was that before everyone spread out to enjoy their day at the park, they all gather together to take a big group photo. Having warned them of this in advance, they were all ready for it, and it was just a matter of selecting the right sculpture to gather around. I picked the Chinese Acrobats by Tawanese-born, Paris-trained artist Shiau Jon-Jen. I got everyone in place, and then realized that all the other park guests who'd just been standing close by area had disappeared, with no one nearby to hand off my camera to. Quickly scanning the area, I saw a woman with a small son and held up my camera, pointed to the group, and gestured frantically for her to come take the photo. I have never, ever seen someone's face light up so dramatically, and she quickly ran my direction... and then swerved to the group, jumping into the frame and posing with her son, smiling broadly. I laughed so hard. And I also wasn't about to tell her to get out of the photo and come use the camera. 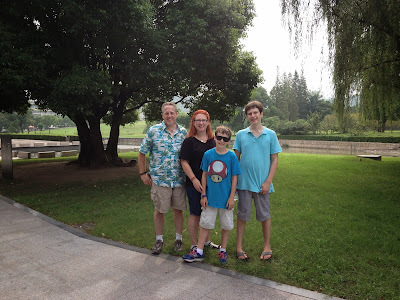 Fortunately a slow moving pregnant woman came waddling by just in time, and I begged her in Mandarin to take our photo. And by "begged her in Mandarin," I mean I just repeated the word for thank you while pointing at my camera and then pointing at our group. She understood and took a handful of photos before I thanked her again repeatedly. After viewing the photos last night on my computer, I had a laugh all over again at our new friend with her son who'd jumped into the photo so happily. I noticed that in the last photo she probably realized she may have misunderstood my request and she can be seen scurrying away. It made me realize that my force in gathering people for a group photo has reached Jedi proportions. I'm wondering if my photography project for next year should involve gathering random strangers together to have their photos taken. Hopefully I can use my powers for good and not evil. Though I've noticed my kids will always say being forced to have their photo taken is evil. Guess I'm on the dark side. Call me Darth Camera. 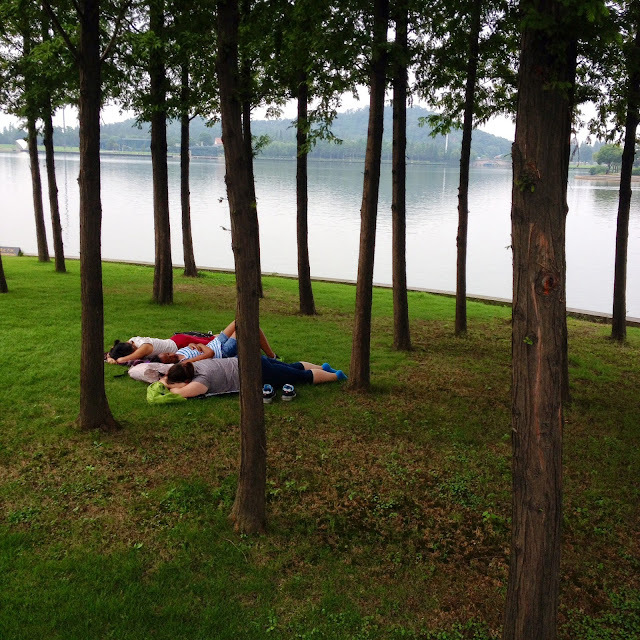 The rest of the day was pleasant and relaxing, and it was fun to chat with different people in the group as we came across them having fun, eating our picnic lunch, and seeing three friends who'd sprawled out on the lawn to take Mid-Autumn naps. I guess they were just knocked out by nature, creating their own art in the process. I call it Teachers Dreaming by the Lake under Trees. As I myself drifted off to sleep last night to the sound of late-night fireworks in the neighborhood marking the festival, I realized what I'm most grateful for on this holiday is being able to bring people together in this far away land to celebrate a holiday that isn't my own, with the people who have become my own, through friendship and shared adventures. Can't wait for the next one! Darth Camera -I love that you can gather people together. I miss having you near by. You should totally do a jedi photo project with random strangers! Chocolate Hair/Vanilla Care, the book!